I am trying to rename my Windows / Boot Camp partition from "EFI Boot" to "Boot Camp" or "Windows". But I do not figure out where to rename. I tried bless command on the NTFS Volume, I tried creating the folders "System/Library/CoreServices" and copied the .disklabel file into it (or also blessit) but nothing changed. 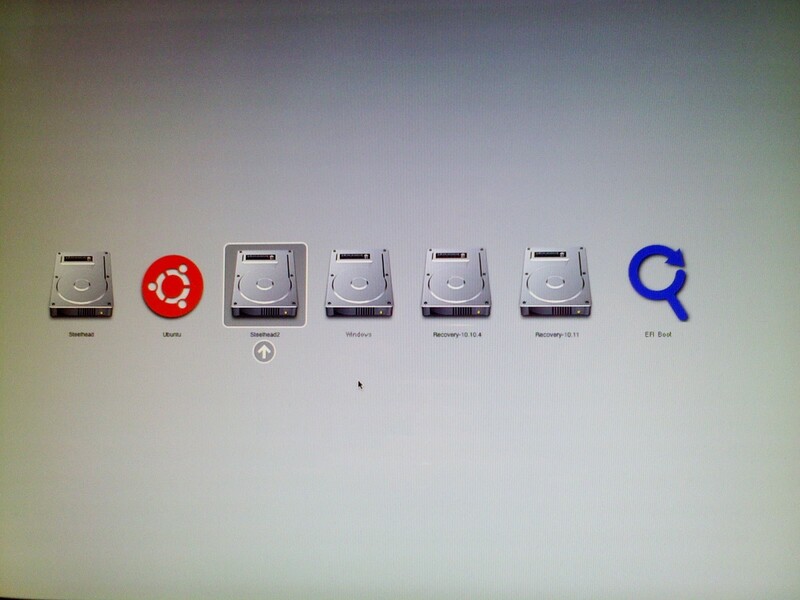 Finally I got the Volume Icon on Boot Selection to work by copying the icns File onto the EFI partition. Also tried blesson the EFI partition – but this also do not work. So I have my Icon, but I also would like to rename it – how can I do this? Systems are Windows 10 and macOS Mojave. I believe you are looking to create an entry in the Startup Manager menu where the entry has a custom icon and custom label. The image below shows this for Ubuntu. (For a better view, either click on the image or open image in a new window.) In your question, you have indicated you found how to create the custom icon, so I will not elaborate on this. You will find creating the custom label is a bit more difficult. First of all, the volume containing the .VolumeIcons.icns file should be Mac OS Extended (Journaled) formatted. The name of this volume will appear as the label on the Startup Manager menu. In this example the volume name is Ubuntu. The content of this volume is shown below. Basically this volume needs to be setup to appear as a legacy OS X boot volume. Note: Normally the Ubuntu volume would not appear in the Finder. In other words. the /etc/fstab file was edited so the Ubuntu volume would not auto-mount. I used the diskutil command to manually mount the volume. Also, the Finder windows does not normally show the hidden files. Some installations actually store the operating system boot files in volume. In this example, I instead chose to install rEFInd to silently boot Ubuntu. In other words, I added the following lines to the bottom of the default refind.conf file. The actually Ubuntu boot files are stored in the hidden EFI partition, as shown in the image below. 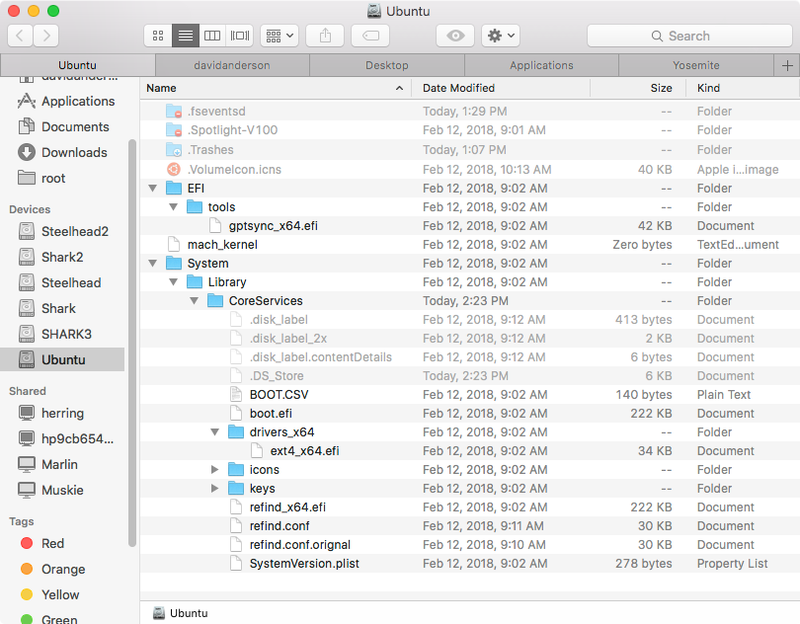 Note: The hidden EFI partition does not normally appear in the Finder and the Finder does not normally show hidden files. Note: There is no /EFI/BOOT folder containing an Bootx64.efi file. This was done so a default icon labeled EFI Boot would not appear in the Startup Menu. What I do not understand is why you want to know how to do this with respect to Windows? Normally, the Startup Manager automatically inserts a Windows label for a properly installed Windows. There should be no need to apply the above procedure. Not the answer you're looking for? Browse other questions tagged bootcamp partition boot efi .